We hope you all had a fantastic Thanksgiving and got to enjoy some time with family and friends. We spent the day together and enjoyed great food and felt grateful for so many things. With Thanksgiving over we’re in full swing of the Christmas spirit over here. We usually don’t blog a lot in December because we spend extra time with our family at this time of year but we do have a few things we will be sharing this month. We’re participating with the #LIGHTtheWORLD Christmas challenge on Mormon.org. Whether you share our faith or are of another faith we invite you to join in the Christmas spirit and spread love this season. Bread is a basic food that can be made from the most common food storage ingredient, wheat. It also has a lot of symbolism in the bible. “And Jesus said unto them, I am the bread of life: he that cometh to me shall never hunger; and he that believeth on me shall never thirst.” John 6:35 For this day: “Watch an online tutorial to learn a new skill that can benefit others”. We are here to help with that! This post has a full tutorial on how to make bread complete with a recipe card and a free downloadable Bread FAQ. Jesus understood that life’s storms can take many shapes. Some storms rain down from the sky; other tempests come from within. The Master can calm all storms. When we follow His example, we can be a light in the lives of those going through turbulent times. 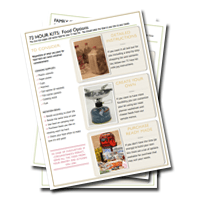 Share peace of mind with our free complete emergency prep plan found here. We hope you have a very Merry Christmas! We recognize you may not celebrate the same holidays that we do but we find that most our readers everywhere celebrate LOVE and SERVICE and we invite you to join in and #LIGHTtheWORLD!